Noodles in any edible form is one family favorite. We celebrate birthday’s with pansit or pasta dish that symbolizes long life and we (Daddy C to be exact) need some comforting we crave for some noodle soup and chocolate cake. Our close friend’s, the Cruz family, invited us to Wagamama for some pre- Christmas celebration last year but it didn’t push through, Daddy C and I thought that it was just another Japanese restaurant in Dubai, we are loyal to our favorites – Tomo and Bentoya. We finally got a chance to dine at Wagamama at Al Fattan Tower, Jumeirah Beach Road. All of us were very hungry, stuck for almost 45 minutes and just a block away from the building. Browsing their online menu kept us busy (and hungry! ), probably not the wisest decision but I want all of us to decide what to order so we don’t have to wait a long time for our food. The restaurant had a very relaxed atmosphere with long wooden tables that reminded me of school cafeteria only nicer. They already had several guests dining, among them were two family with young kids, and they looked happy with their meal. As soon as we were seated, the staff gave us the menu and handed the LittleOnes a Hoshi coloring sheets and crayons. LittleMiss comfortably sat beside me on the bench, they didn’t ask or offer a high chair for her but I saw one of the young guest seated in one. For appetizer we ordered duck gyoza, lollipop prawn kushiyaki, edemame with chili garlic salt, miso soup and Japanese style pickles. Wagamama definitely had us hooked at Lollipop Prawn Kushiyaki, grilled prawns marinated in lemongrass lime and chili. LittleMan V love eating prawns but got turned off when he heard chili in the description, we insisted that he must have a bite as it was so yummy. We had to order two more kushiyaki plates because three pieces is just not enough, V said. LittleMiss C enjoyed a piece of grilled prawn but preferred Duck Gyoza, and yes we have to order another plate of it as well. My kids have big appetite when we eat out. Can we get fresh Edemame in Dubai? I’ve bought frozen ones but can’t achieve the crunch like the one’s we have in restaurants. We enjoyed munching on them while waiting for our mains. LittleMiss enjoyed the miso soup while dipping her gyoza on it, this made Kuya V upset. LittleMan ordered mini chicken katsu with curry sauce. He enjoyed every bite of the chicken without the curry sauce. I tried the curry sauce and it was yummy but it wasn’t to his liking. LittleMiss had the mini chicken yaki soba. This was really good, even the big brother agreed that his sister’s food was better than his. LittleMan so serious eating his Mini Chicken Katsu. LittleMiss dinner spread of duck gyoza, mini chicken yakisoba and fresh juice. 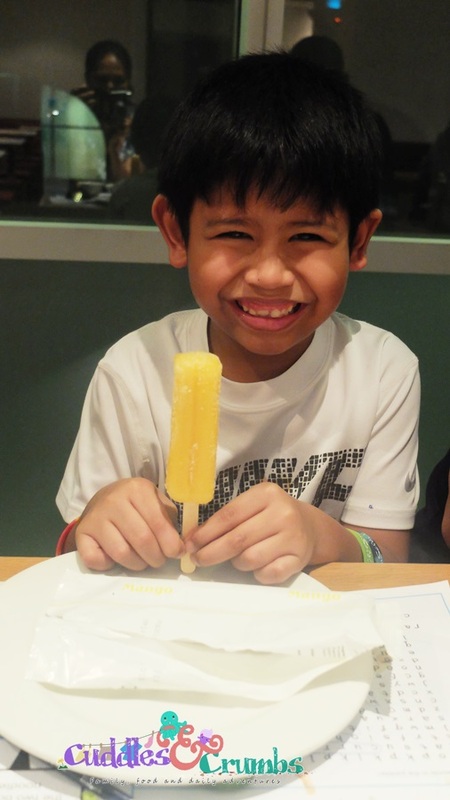 It was only last September that Wagamama introduced Hoshi to Dubai along with launching their kids menu. I’m happy that they didn’t create a totally different menu for kids, what they did was offered a child friendly version of their classic’s. 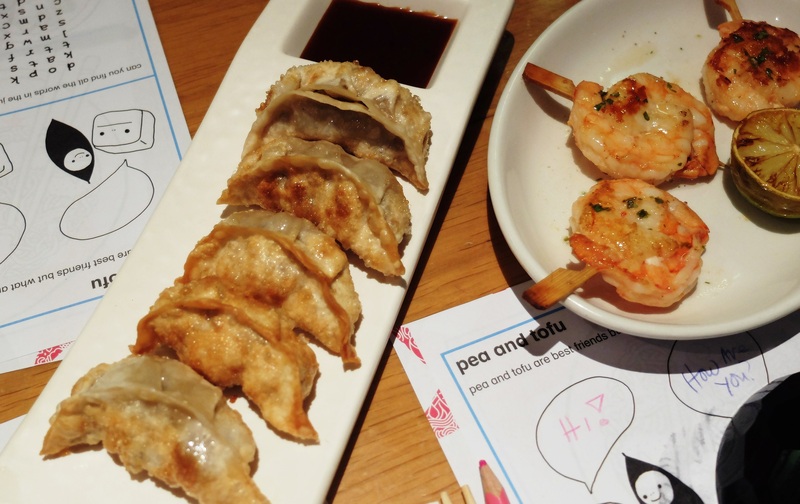 The people behind Wagamama know that kids do appreciate a good meal. Don’t be fooled by the word “mini” on each of the dishes, the portion is enough to satisfy a not so hungry Mom & Dad as well. Daddy C and I ordered wagamama seafood ramen and grilled duck ramen. Daddy C expected his ramen to be spicy, unfortunately for him the dish was not intended to be spicy. Seafood meat on his ramen was fresh and had a good bite to it, although he enjoyed the broth it needed something more to make it an outstanding ramen. My grilled duck ramen had a refreshing taste to it and the meat was tender and bursting with flavor by itself. This was one spicy ramen, not the offending spicy taste that sets you off as soon as it touches your tongue, this one makes you appreciate the broth first then the spice kicks in. We both notice though that our noodles was overcooked because it was no longer chewy, not soggy but almost. It didn’t allow us the joy of slurping our noodles. The noodles on LittleMiss’ mini chicken yaki soba was cooked perfectly, this could just be an unfortunate incident. Maybe our ramen sat a minute longer on the chef’s counter before it got to us? We we’re already full but argued that it would be a sin to not have dessert, so we did. Daddy C and I shared a slice of white chocolate ginger cheesecake paired with cafe latte and the LittleOnes each had ice lollies. I was surprised that Daddy C chose a ginger flavored dessert for us since he’s not very fond of it. It was something new and we had to try it. He took the first bite and really liked it, declared that you can only taste a hint of ginger and suggested at the end that I should re-create it at home. We both agreed that the ginger taste was definitely in the crust. Wagamama has casual and family friendly ambience for everyone to enjoy. We’ve only tasted few item’s on their menu, a next visit is a must and we are giving them another chance to satisfy our noodle slurping joy. To learn more on what Wagamama has to offer, visit the website and like them on facebook. Disclaimer: We were invited to dine at Wagamama. All opinions are my own. First of all your C is getting so big and growing in cuteness too! For the edamame, my tip is not to boil them too long. In fact, I go against the grain and only boil them to defrost, not to cook. I put the pot on the stove with water (just enough to cover the edamame) and put the fire on. As soon as it starts to boil, I switch it off and immediately drain the water. I hate soggy, mushy edamame and that’s absolutely not the way they are to be eaten either. Thanks for the tip Mio! 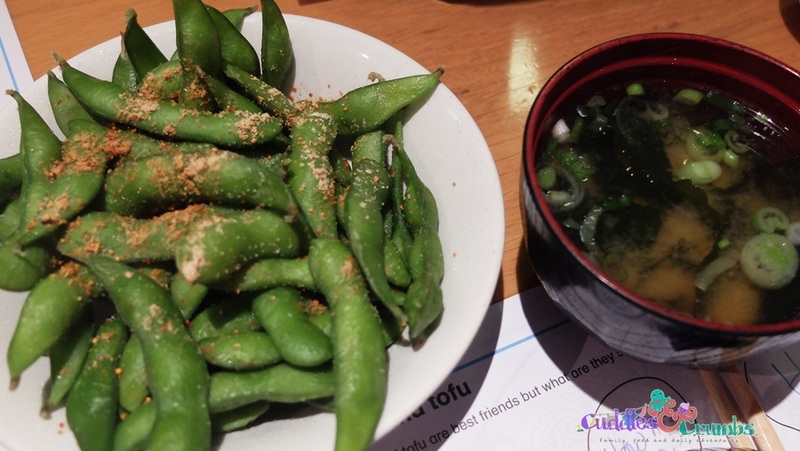 Edamame is one of the few healthy stuff both kids declare yummy.